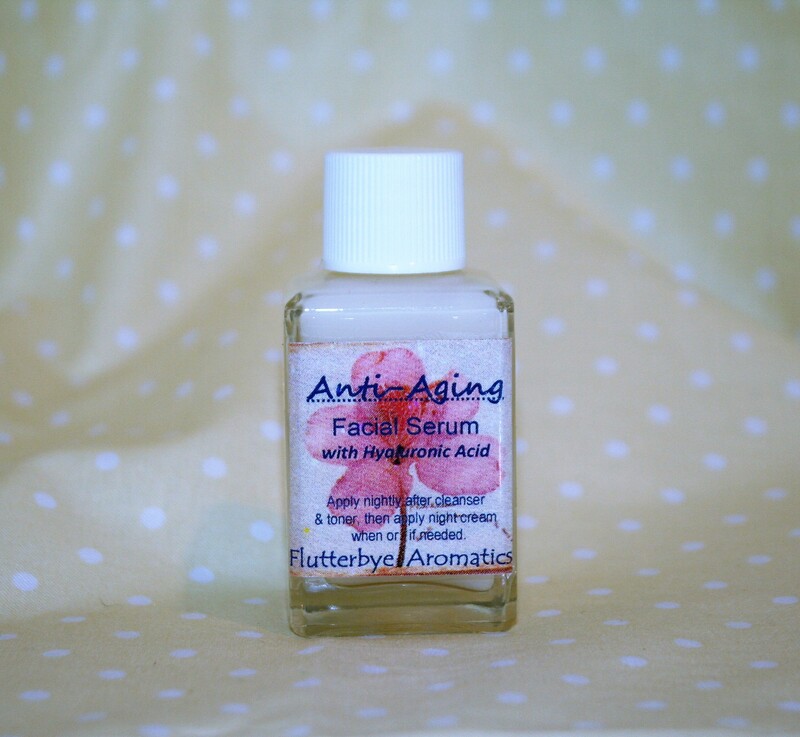 ANTI-AGING SERUM with Hyaluronic Acid - Special price! Rejuvenating, regenerating, anti-wrinkle, ultra moisturizing, protective, plumping! For all skin types. If you are past the age of 29, for real, this is the nightly serum to prevent everything the woman of 50 is groaning about. Seriously, this is the formula I've been working on for a long time (sourcing superior ingredients) and finally have a result I am proud to offer as a superbly hydrating & age preventive facial moisturizer -- a superior product that can honestly rival the big price tag cosmetics for smoother, plumper, softer skin. Give it a try, I promise you will be happy you did. Proven anti-aging properties fill in, plump up and diminish the look of fine lines and wrinkles. Remember, we cannot remove the wrinkles but we can improve skin texture so that they appear diminished -- that's what all that bla bla bla means in the commercials. 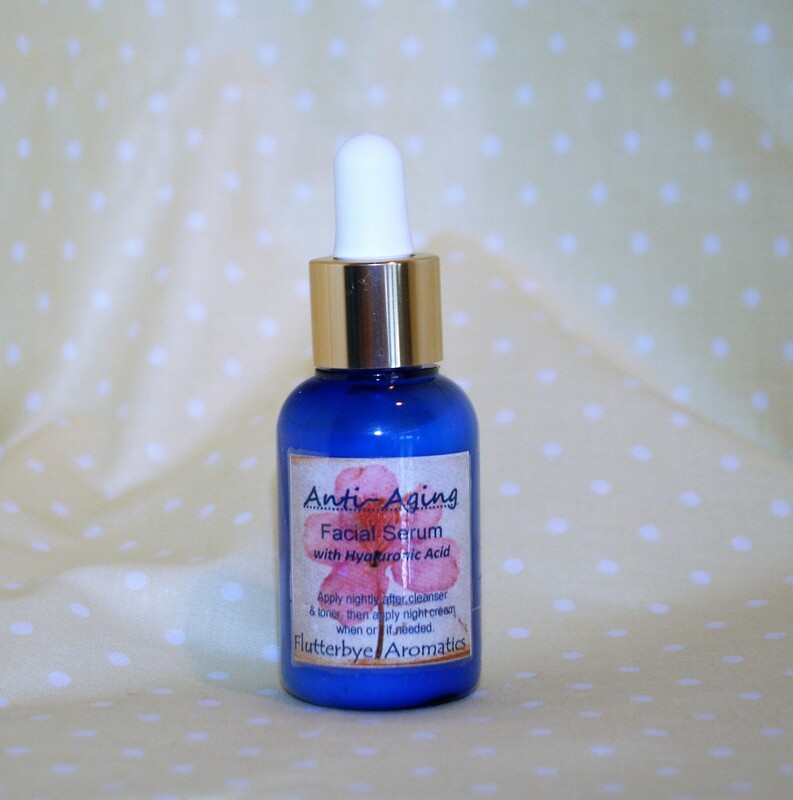 This hyaluronic acid serum for your face is an extremely effective anti aging, anti wrinkle treatment. Use daily to see best results and maintain healthy skin. Organic rose hydrosol, organic aloe vera, *Hyaluronic Acid, CoQ10, *Retinyl Palmitate, Alpha Lipoic Acid, Vit E, Vit C, Vit A, Vit B5, Vit B3, meadowfoam oil, organic carrot tissue oil, *organic fruit acid extracts (orange peel, bilberry, lemon peel, cranberry), organic sugar maple, EDTA, lecithin, Rose Otto, carrot seed, neroli, geranium, willow bark ext, rosemary oleoresin, grapefruit sd ext. **Paraben-free, no alcohol, artificial or synthetic dyes, colors or scents, no preservatives, no propylene glycol, sulfates, synthetic fragrances, or phthalates. Read more about Anti-Aging Serum. Skin Types: All skin types, but particularly beneficial for Sensitive, Rosacea, Mature, Dry, Normal, Combination. Bulgarian Rosewater (Rosa Damascena hydrosol) refreshes, nourishes and soothes the skin. Helps protect against irritation, so is especially beneficial to sensitive skin. Contains anti-aging properties that stimulate collagen production and help reduces wrinkles. Rose Hydrosol has the ability to remove skin redness by tonifying the capillaries just below the skin's surface. Increase the effectiveness by using Rose Hydrosol as your toner before using the cream. Organic Rose Hydrosol, Coconut Oil, Organic Jojoba Oil, Organic Witch Hazel Hydrosol, Vitamin E, Black Willow Bark Extract, Neem Oil, Vegetable Glycerin, Citric Acid, Rosemary Oleoresin extract. Promotes tissue regeneration and provides the opportunity for skin to be nourished and softened. All this for removing eye makeup you say? Well, remember -- your eyes are the most important part of your face, and the skin around the eye is the most fragile and the *thinnest*. That's WHY you should care for your eyes and face with very fine natural, luxurious oils that remove makeup "gently", but also nurture the delicate skin. Apricot kernel oil, arnica oil, sea buckthorne oil, jojoba oil, borage oil, evening primrose oil, avocado oil, macadamia nut oil, rose hip see oil, Vit. E oil, Vit. A oil. Essential oils: clary sage, roman chamomile, german chamomile, lemon, lavender, petigrain. Nature's gift of stimulating sea salts, flower essences and natural powders are blended with essential oils to open the pores and prepare the face for cleansing. Directions included for making a simple warm water compress for the face to heal, tone, stimulate circulation, oxygenate and rejuvenate the tissues, while healing and preventing blemishes. All skin types, especially troubled and acne. Our most effective tool in clearing problems! This cleansing bar is rich in healing herbs & imbued with antiseptic and soothing essential oils. Hemp oil, organic extra virgin olive oil, organic virgin coconut oil, jojoba wax, organic aloe vera gel; French white clay, charcoal neem, collodial oatmeal, rose petals, lavender flowers, burdock seed and pure essential oils. A powerful combination of herbs and oils to disinfect, dry and clear up any area that exhibits pimples, blackheads, whiteheads, cysts, boils, fungus and infection. May also be used on bug bites and cuts. An amazing daily face cleanser that is gentle enough for all skin types yet provides deep pore cleansing and skin balancing. This formula is very similar to our clay bar soaps (French Mud, Mermaid, Rhassoul Face, Dead Sea Mud), but in an easy-to-use squeeze bottle. Designed for all ages to maintain a beautiful complexion and especially for those who need to control blemishes, both male and female. You may also use this on any body areas in need, especially shoulders, upper back, arm backs, neck and chest. To use: Soak a face cloth in very warm water, apply to face and leave for a minute. This is not only very calming but it opens the pores to allow the product to do its job better. Apply the cleanser with hands and either rinse off or leave on for 5 or 10 minutes. Rinse with warm water, follow with your favorite hydrosol (chilled feels great after this warm cleansing and helps close and tighten pores), eye balm, facial serum and moisturizer. This product is unscented, if you would like essential oils added, please leave me a note in the Comments section at checkout. Enjoy!! French green clay, French pink clay, helichrysum, geranium hydrosol, cypress hydrosol, aloe vera, DMAE, Vitamin C ester, GSE, rosemary ext, xanthan (opt EOs). 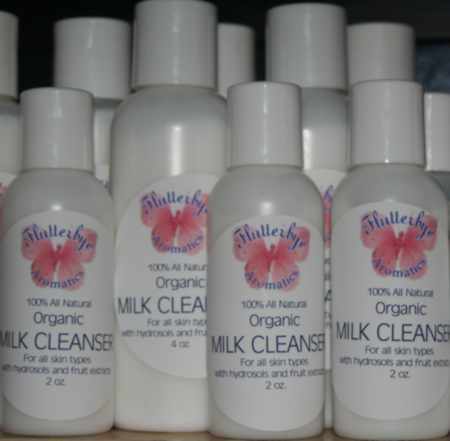 Organic Milk Cleanser is a very gentle, creamy, mild cleanser containing beautiful ingredients -- aloe vera, milk, chamomile hydrosol, lavender hydrosol and green tea extract --which makes this cleanser ultra mild and refreshing. The gentle, natural exfoliating agents of several organic multi-fruit acids such as bilberry, sugar cane, orange, lemon, cranberry, provide mild exfoliation which leaves your skin feeling soft, smooth and clean, not stripped. Directions: Take just a moment morning and night to care for your skin. Begin by placing a warm, wet cloth over your face to dampen the skin and open the pores. Apply the milk cleanser with your clean hands, gently moving in circular motions in an upward direction. No fancy gadgets are needed. Rinse with warm, then cool water. 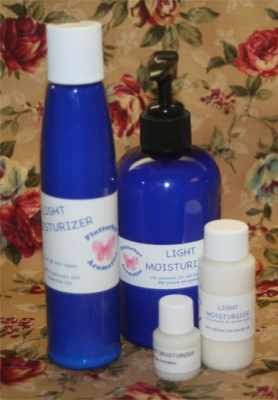 Follow with facial toner/hydrosol, eye balm and moisturizer. Lovely. Our 100% All Natural facial cleanser is very gentle, nourishing, made with pure fresh honey, hydrosols and essential oils. It gently cleans, softens, tightens, and tones while encouraging a healthy and balancing moisture content for all skin types. I developed this cleanser particularly for my own normal but maturing, and sometimes terribly sensitive skin (particularly at change of seasons), but I also had the needs of several of my dear clients in mind. I love the silky soft feeling of clean, but not stripped skin, which this provides. The hydrosols and precious essential oils promote healthy skin and encourage a natural balance to the skin. Designed for normal skin, but also soothes itchy, dry and inflammed skin. Rose hydrosol balances sebum production, tightens pores, calms rosacea. Carrot Seed hydrosol calms eczema and psoriasis. Neroli hydrosol calms, rebalances, tones, and refines pores. DIRECTIONS: Use a headband to keep the hair away from your face. Use a small amount of cleanser on wet hands. Take your time and massage into the face, this is time well spent encouraging circulation. Use hydro complexion sponge to provide even more benefit. Pay attention to any problem areas, especially around the hairline and nose wings. Rinse with lukewarm water, never hot or cold. It's very important to tone after cleansing. Use your favorite hydrosol on a cotton pad and slowly and thoroughly wipe your face at least twice. Moisturize while your face is damp from the hydrosol, and enjoy your beautiful, fresh skin!! Please Note: This cleanser is high humectant and non-sudsing, it does not produce a lather. 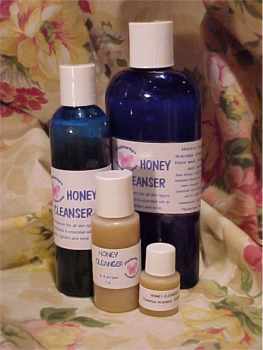 If you prefer a high sudsing cleanser, see Honeybee soap for rich, high lather and loads of honey in a facial bar. This pairs beautifully with French Clay Facial Bar. This creamy combination of honey and oats combines with superior ingredients to create a daily moisturizer that is ultra soothing for sensitive skin and beneficial to all skin types: Mature, Dry, Normal, Oily, Combination, Sensitive, Acne. Very creamy and absorbs quickly, feels silky and dewy; leaves no film or greasy feeling. 90% organic ingredients include Organic Aloe Vera, Rose Hydrosol, Witch Hazel Hydrosol, Vitamin E, Sweet Almond, Organic Honey, Organic Coconut Oil, Organic Oatstraw, Black Willowbark, Rosemary Oleoresin. This moisturizer is one of our top customer favorites; it has a lighter texture than the Milk and Honey Lotion and is a non-greasy formula for all skin types. 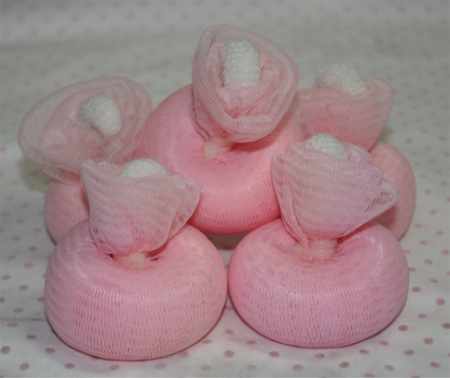 It absorbs quickly, leaving soft, nurtured and silky skin. Apply after cleanser and toner morning and night. For extra dry skin, apply after Facial Oil. It's important to remove expired skin to promote healthy new skin, but it's very important to do this without using harsh ingredients. Lovingly made upon order with organic Japanese Adzuki Beans, organic basmalti rice bran, organic mung beans and Flutterbye secrets, for all skin types. Slough off dry skin patches, detoxify, and encourage faster skin cell renewal. Result: Healthy, glowing, younger looking, smooth skin, and beautiful, tighter pores! Great for all skin types and gentle enough for mature, sensitive or acne skin (and men!). Directions: In a small bowl or in your hand, mix a tsp. of grains with liquid (or your favorite cleanser) to form a paste, apply to face, gently massage, rinse well. Follow with hydrosol and your choice of Facial Oil or moisturizer. 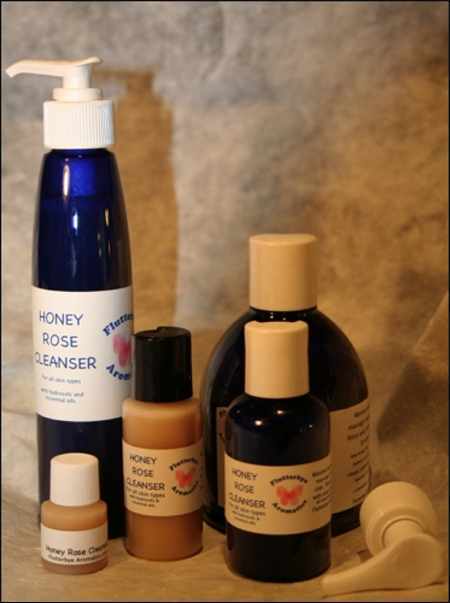 To enhance your facial treatment, mix with the hydrosol for your kin type: rose for dry skin, neroli for oily skin. Gentle enough for daily exfoliation or leave on 15 to 20 minutes for a superb and more intense weekly facial treatment. "I got my washing grains a few days ago and have used them several times now. The way I like to use them best is pretty much as Simone suggested (big surprise, LOL!) by putting them in my hand, adding water to make a loose paste, exfoliating with the grains, rinsing, then washing with my Rose Garden soap. My face feels amazing after doing them, smooth as glass. Not tight, not red, just the smoothest feeling ever. Love these." "Simone, I've been using the grains all week as my nightly routine. They have made a difference in the appearance of pore size, I've notice a minimization of fine lines. My face is so much smoother than it's been for a long time. I love them and really want to try your new argan body scrub!!!!" "The grains are helping to get rid of the dry patches my face has developed with the advent of the super cold weather -- I love them for that, and for my hands too, as I scrub them with the remaining grains once my face is done. Thanks Simone!!!" (2nd message): "This morning I followed the scrubbing grains with Simone's Organic Milk Cleanser rather than soap ..... WOW!!!!!! I think my skin is the softest yet after that, it's amazing!" "(day 1) OK -- I just have to say I love them (Adzuki Grains) -- My face is the tiniest bit dry -- but there is no humidity today -- and it feels so clean. Because I used my normal face wash it also rinsed off great -- and the pores look like salad plates instead of dinner plates! (day 2) Oh oh oh -- I just used them on my elbows - WOW WOW WOW! I would get them just for that! lol Before I got in the shower -- I rubbed my fingers over my nose and could feel something not bumps as they would be bigger than what I felt. After using the grains my nose felt smooth and the pores are now down from salad plates to saucers! And it's helping on my neck under my chin where I have a few ingrown hairs! It just gets better." "I used the adzuki cleansing grains this morning and they are wonderful! My skin had a slightly dull look prior to, and afterwards my skin had a nice glow. My skin felt really clean, almost squeaky but it didn't feel dry. I had no redness on any area and usually my cheeks turn pink if a product is too strong. I used them with Rose Hydrosol and soap. Followed with the Hydrosol and then my eye treatment and facial oil. 2 hours later my skin tone still loks even and my pores are still small. My skin feels just right ... No oily or dry spots seen." "My face feels so smooth! After rinsing the grains off I used my pumpkin soap...face feels so clean!" "My husband just tried them and he LOVES them -- he asked me if they came in a bar so he could use them all over!!!" Prickly Pear (aka Indian fig, Barbary Fig, Cactus Pear, and Spineless Cactus) Grows and flourishes in arid and semiarid climates. India, Morocco, and Tunisia have the most desirable and productive climate for growing this cactus, and thus produce the largest amount of premium quality Prickly Pear Seed oil of all worldwide growing locations. This invigorating, soothing scrub adds vitality to dull and lifeless skin. Your skin will look brilliant and healthy. All signs of fatigue vanish! Gentle Rooibos neutralizes free radicals while aloe vera helps to purify. City dwellers exposed to harmful environmental pollution (from cigarette smoke to urban smog) will love this special, deep cleansing scrub when made part of their skin care regime. Rooibos is a powerful antioxidant and this gentle scrub is an excellent way for your skin to absorb its properties. Replace your cleanser with the scrub once or twice a week. Directions included. Always follow exfoliation with a toner (hydrosol) and moisturizer. Rooibos Facial Serum has been designed to work beautifully following the Rooibos Facial Scrub. Exfoliation is very important to maintain healthy and youthful skin. Dead skin cells multiply faster as we age. Recently, Japanese scientists found that Rooibos tea contains a mimic of the enzyme Super Oxide Dismutase (S.O.D.) which is an antioxidant that attacks the free radicals and limits their damaging effects on the skin. The addition of coconut, jojoba, olive, and avocado oils make this the perfect gentle cleansing scrub. Skin Types: All skin types, including mature and sensitive. Organic Rooibos Tea, Organic Aloe Vera, Organic Coconut Oil, Kosher Vegetable Glycerin, Organic Olive Oil, Jojoba Wax Beads, Organic Jojoba Oil, Avocado Oil, Witch Hazel Hydrosol, Vitamin E, Organic Black Willowbark. Our Rooibos Facial Serum was developed to enhance all skin types. Powerful ingredients including DMAE and MSM make this the perfect serum, particularly for acneic, oily and sensitive skin. DMAE has been called the "face lift in a jar" by skin specialists. It helps firm and tighten facial and neck skin. With continued use, it helps strengthen and stabilize cells' plasma membrane for a more defined youthful appearance. Fine line reducer and power minimizer; the serum is lightweight and absorbs easily. It can be used as a final moisturizer for oily skin types. Mature, dry and combination skin should use a moisturizer afterwards. Recommended use: 3-4 drops at night on damp skin. Skin Types: Mature, dry normal, oily, acne, sensitive and combination. Organic Aloe Vera, Organic Rooibos Tea, DMAE, Kosher Vegetable Glycerin, Organic Jojoba Oil, Vitamin E, MSM, Black Willowbark Extract, Meadowfoam Seed Oil, Rosemary Oleoresin, Neem Oil. This natural source of Retinol A has been scientifically proven to eliminate surface wrinkles, prevent wrinkles, fade age spots, regenerate damaged skin, and soften and reduce the appearance of scars and stretch marks. Glides on smoothly because it resembles our skin's natural oils -- absorbs quickly and does not leave a greasy feeling. Rejuvenating, regenerating, nourishing, hydrating, anti-aging, protective. Rosehip Seed Oil, Argan Oil, and superior essential oils, including anti-inflammatory German Chamomile, provide a beneficial layering serum to bring the skin into balance. For all skin types. Use alone or underneath your day lotion or night cream according to the needs of your skin. Dear Simone, I must admit, I was one of those lucky women with great skin all through my teen years and early twenties. As I stand on the brink of 30, I am beginning to see that simply washing my face when I shower is not going to cut it anymore. I have tried a few face lotions formulated to keep skin looking young. 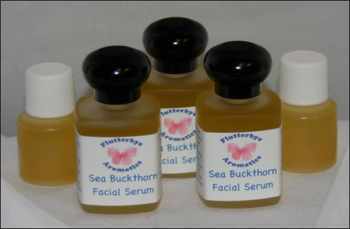 I used them and never complained until I tried your Sea Buckthorn Facial Serum. I never knew what I was missing! At first it was weird to put oil on my face, but it soaked in immediately and did not leave the mask-like film on my face that the lotions do. My skin looks better and healthier, feels so soft and I have noticed a huge difference in just a few applications. A little goes a long way as well. Thanks again, I am sold! This decadent face serum promotes cell metabolism health by utilizing the best oils in the world for the face. These precious ingredients feed your skin with vitamins [A, C, E, B, K] and essential fatty acids including Omega 3, 6, 7 and 9. Some of the rich and skin-healthy oils include Rose Hip Seed Oil, Sea Buckthorn Oil, Camellia Oil, Pumpkin Oil, Cherry Kernel Oil, Avcado Oil. Rose, Frankincense, Carrot and Chamomile essential oils. Everyone loves this, even men! Anti-aging, nourishing, combats pollutants, improves skin texture. Moisturizes the face and throat. Leaves your skin feeling like velvet and looking luscious! Facial Oil, Rosacea, 7 ml. Facial Oil, Rosacea, 15 ml. Facial Oil, Rosacea, 30 ml. Clay may be used to help firm, tone & refine the skin to appear smooth, supple & clear. This is another gorgeous Australian clay -- for oily or problem skin. 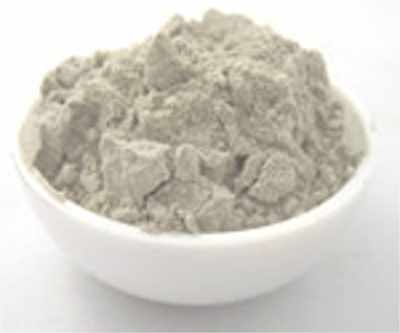 This clay regulates sebum flow, cleanses hair follicles and dissolves impurities on the skin. 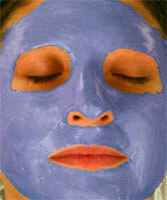 Just add your selected hydrosol or purified water to make a soft mask and apply to face. Leave for about 15 minutes, then rinse off. Use every other week or once a week, depending on your needs. You may also add your selected essential oils if you desire. This is the most gentle of the clays. Ivory Clay has a very mild, nourishing action which is particularly good for sensitive skin. *Anti-aging, anti-wrinkle, multi-benefit skin treatment. * All natural (always paraben-free), for all ages and skin types, including teenage to mature. "This is my new favorite mask, I can't stop feeling my soft skin!" As we age there will be various changes to the complexion, most, if not all, unwelcome. Along with the typical signs of aging such as fine lines and beginning wrinkles, adult acne may pop up, very often as chin acne. I was fortunate to not have teenage acne, so these new eruptions in the last year were a surprise for me (panic!) so I zealously researched to find the most effective yet available and affordable ingredients to not only treat but also prevent blemishes. To avoid drying out the already dry-ish (mature) skin, I added Hyaluronic Acid which is the absolute best, most potent moisturizer available and produces beautiful results here. So that's how I discovered the importance of *Activated Charcoal, **Hyaluronic Acid, Rooibos and Green Tea Extracts, Vitamin C ester, and other contributing ingredients like essential oils, organic jojoba beads (exfoliating) and ***DMAE (skin firming) to develop this multi-tasking, ultimate cleansing and clarifying mask to pull out toxins and dead skin cells. I was already using several of these ingredients in other products, but was able to prepare them in a dynamic synergy to boost hydration after deep cleansing the pores, resulting in toning of the skin texture. This mask is ready to use, it's a grey color in the container, but once applied is a colorless, thin gel. It will become slightly firm but not tight like a clay mask. Benefits: It's gentle enough for sensitive skin and does not smell, is easily removed with warm water, is antioxidant rich and I think you'll love using it once to several times a week or even daily if desired, depending on your skin type. It is not harsh and will benefit problem-free skin by keeping it vibrant! Use: Always start your facial cleansing by applying a very warm water-soaked face cloth over your face and leave it for a minute to open the pores and prepare them for deep cleansing. Use your cleanser & rinse as usual to get the surface dirt or makeup off. Apply mask in a thin layer. Start with a 10 minute treatment and increase or decrease according to your particular skin needs. Apply with hands and remember, it doesn't make it more effective to have a thick layer sitting on the skin, just a nice coverage of the skin is all that is needed. Rinse off with warm water, follow with your favorite hydrosol and moisturizer. * ACTIVATED CHARCOAL: Used in acne products to draw out impurities, heal pimples, and prevent further breakouts. Also an anti-aging ingredient, activated charcoal is said to tighten pores and smooth the skin. It also reduces inflammation which is significant in preventing premature aging. **DMAE: an antioxidant membrane stabilizer. When applied topically, it helps to firm, smooth, and brighten skin. It also enhances the effects of other antioxidants like Vitamin C ester. ***HYALURONIC ACID: a powerful humectant (moisture-binding ingredient) that keeps skin plump, hydrated and young looking. Applied topically in skin care products, it increases hydration, improves elasticity and also reverses free radical damage. It works for every skin type. Other ingredients: Organic aloe leaf, E-wax, willow bark extract, chamomile, vitamin E oil, vitamin C ester, vitamin B3, Provitamin B5, Pomegranate seed oil and extract. $12.50 Provides deep pore cleansing, gentle exfoliation, and beautiful skin toning. 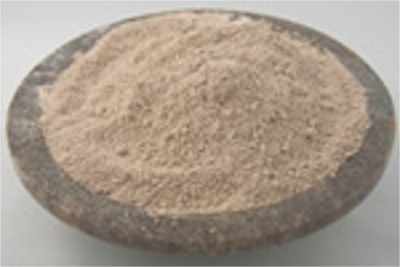 Rhassoul Clay is unequaled in skin care improvement properties. Click here to learn why you will never want to use another clay mask after using this one! I feel like I've finally found the magic formula with this rhassoul clay blend. You will keep touching your face the next day, loving the baby soft skin!! For all skin types; you may find that this weekly mask, along with using an exfoliating bar like French Clay Facial Bar, Charcoal Purifying Bar, or Oatmeal Cream.on other days, is all you need for your beauty facial regimen. Directions come with the clay blend and are very easy. You will use 1 tsp. clay blended with a liquid to make a nice paste. It is much more economical to make your facial mask this way, and better for your skin; if I made it up in advance with a liquid, I would need to use some form of preservative, which you know I don't do. This makes about 12 facials. Use either a hydrosol, milk (almond, coconut), honey, or yogurt to mix it with. This is a very gentle clay, but I recommend sensitive skin types use Chamomile hydrosol to blend it with and as a toner afterwards. Includes: Micronized Rhassoul clay, org rosehips, org green tea extract, org honey, org buttermilk and a few more very special ingredients that are completely natural, organic and gentle exfoliators.